The Aberlour Distillery (rhymes with power) is at the heart of Speyside, and it is situated at the junction of the rivers Lour and Spey. The village of Aberlour has probably been founded during the 7th century when St Dustan used to baptise the converts in the water of the burn flowing from the granite mountain Ben Rinnes. The distillery was founded in 1879 by James Fleming, who shrewdly built it on the site of St Drostan's Well, thus securing forever this important source of pure spring water. In 1898 a fire destroyed several of the distillery buildings and most of the whisky stocks. 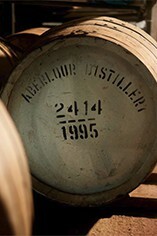 Under the supervision of Scotland's foremost designer of whisky distilleries, Charles Doig of Elgin, the Aberlour Distillery was largely rebuilt. The distillery has been extended in 1945 just after its acquisition by the Campbell Distillers group. This distillery eventually come under the Chivas Brothers group (Pernod-Ricard) ownership in 2002. Peat from the region is used sparingly. The house style is silky-soft, nutty, spicy (reminiscent of nutmeg and cinnamon), and with distinct sherry overtones (25 to 50 % of the production is matured in sherry casks, the remaining part being matured in bourbon casks). 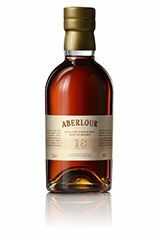 Greater age adds body and a rich raisin character to Aberlour’s characteristic depth and spiciness. Matured in the highest quality casks, where it develops deep Bourbon and Oloroso Sherry flavours, this is the richest and most indulgent Aberlour expression. Perfect in structure and memorably eloquent.